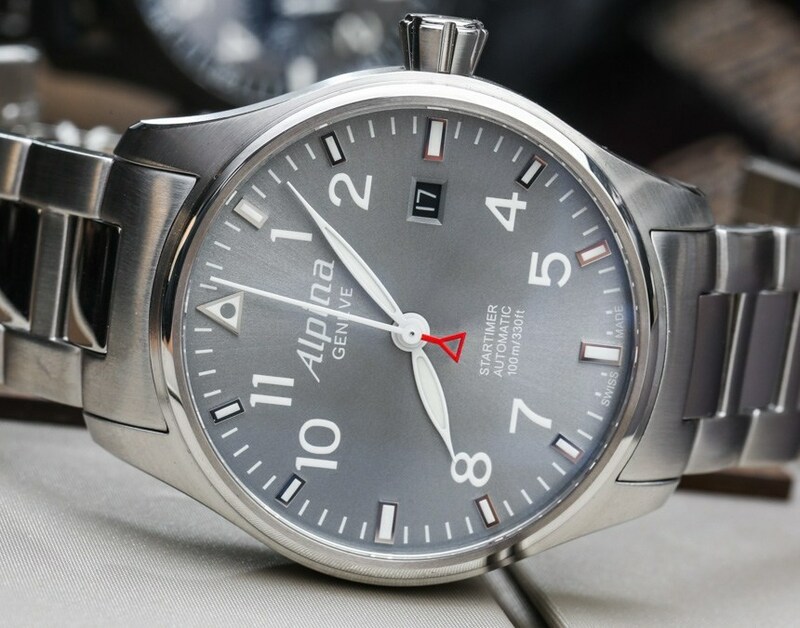 Before discussing some of these rather nice Alpina Startimer Pilot Automatic watches, I want to once again discuss the notion of pilot watches overall. People often ask us about brands that offer reasonably priced pilot-style watches. It is honestly a good question, and one that we struggle to answer. One of the reasons for that is that it is often difficult to strictly define what a pilot watch is, as the concept is a bit more fluid than say the more specific requirements of a dive watch. Second is the notion that what “reasonably priced” means can really vary. You can get a pilot-style watch for a few hundred dollars, or you could spend in the tens of thousands (or more). So let’s focus for now on the concept of a reasonably priced mechanical pilot watch with a Swiss movement. Among the more established brands, Alpina actually has very decent offering. 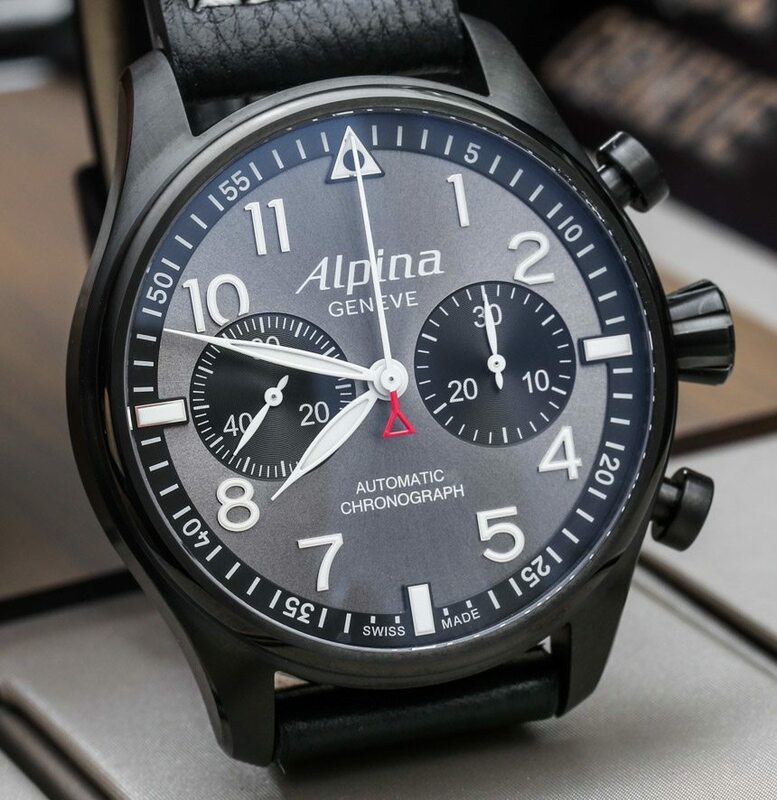 Alpina pilot watches are segmented into a few categories, all under the larger Startimer collection. It can actually get a bit confusing, as you have the Startimer Pilot Automatic, Pilot, Pilot Manufacture, Pilot Classic, and Pilot Heritage product ranges. For now, I’ll stick to talking about some Alpina Startimer Pilot Automatic watches, as that is what you’ll see pictured here. These each contain Swiss automatic movements produced by third parties such as Sellita. 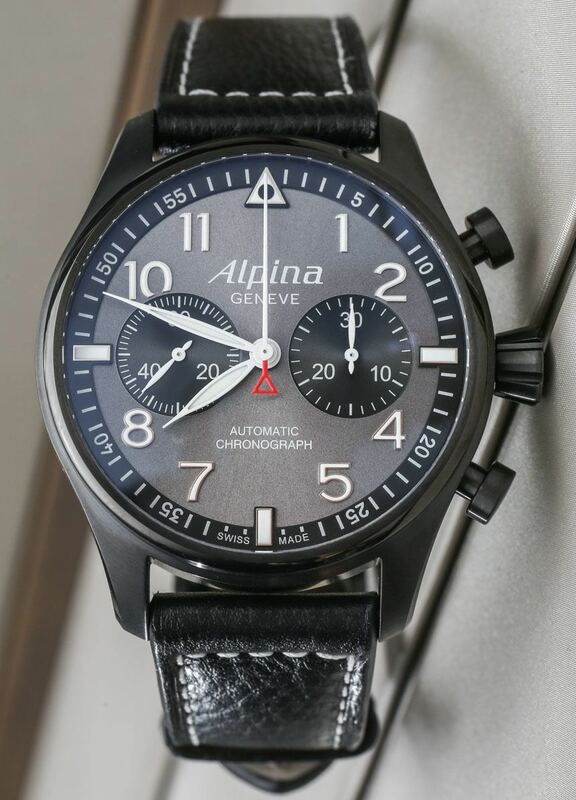 The Pilot Manufacture collection, by contrast, has movements made by Alpina (and parent company Frederique Constant), and collections like the Pilot have Swiss quartz movements in them. I’ve seen Alpina’s Startimer Pilot watches evolve over the years and think that they have hit a positive stride by this point. Detailing and legibility are good, and the overall presentation of the timepiece is just really attractive, with a lot of options available. 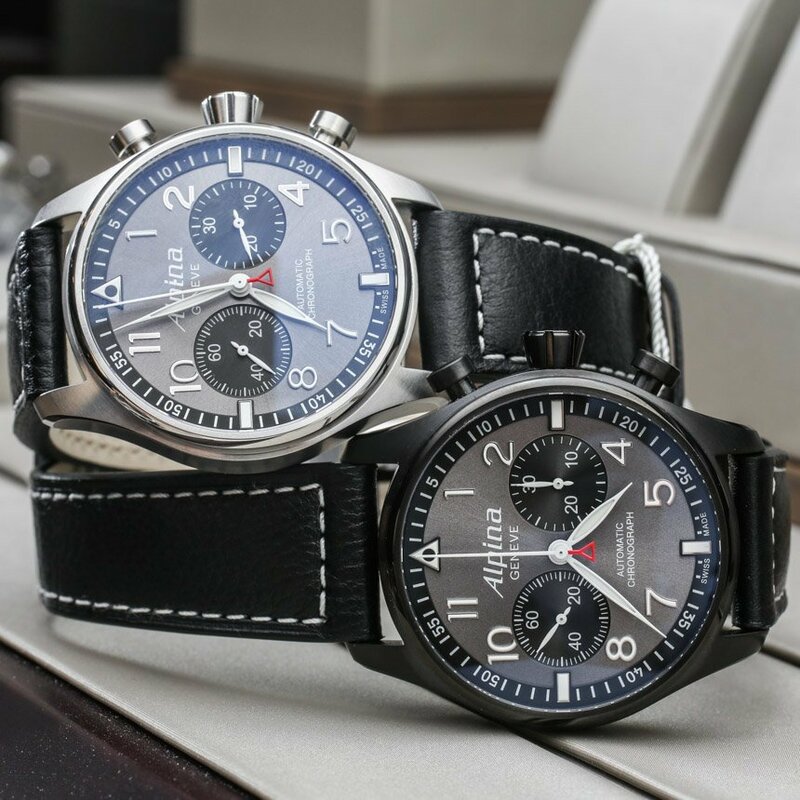 In a nutshell, you have a solid traditional Pilot watch style, with a bit of Alpina design DNA, at comparatively reasonable prices. 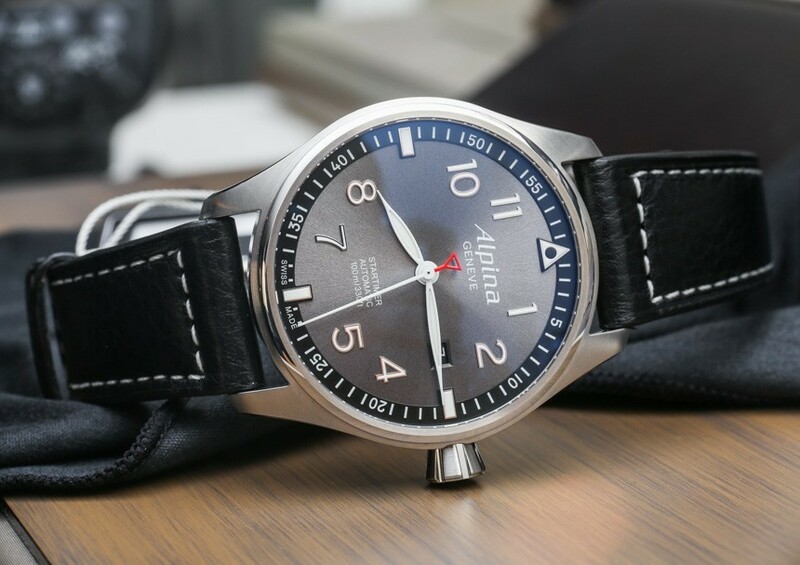 Prices for a 40mm wide Alpina Startimer Pilot Automatic on a strap start at about $1,300, and case sizes are available in both a 40mm wide, as well as 44mm wide. In addition to the three-hand automatic, we also have bi-compax automatic chronograph models. It is sometimes hard to do a chronograph with the traditional pilot watch dial, but I think Alpina does it pretty well in the Alpina Startimer Pilot Chronograph. 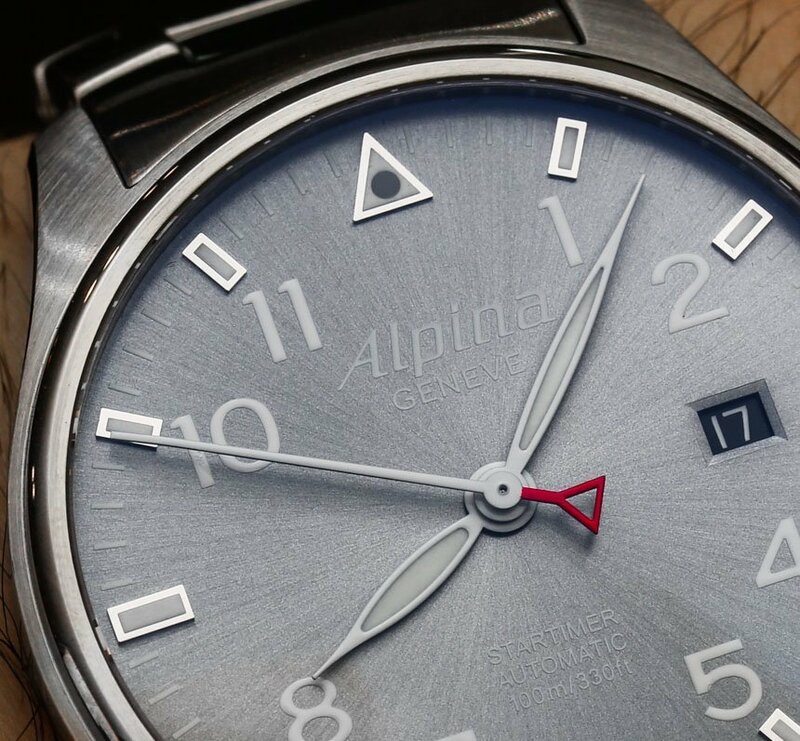 The Alpina red triangle logo further adds some color and personality to the dials as the counterweight on either the seconds hand or chronograph seconds hand. 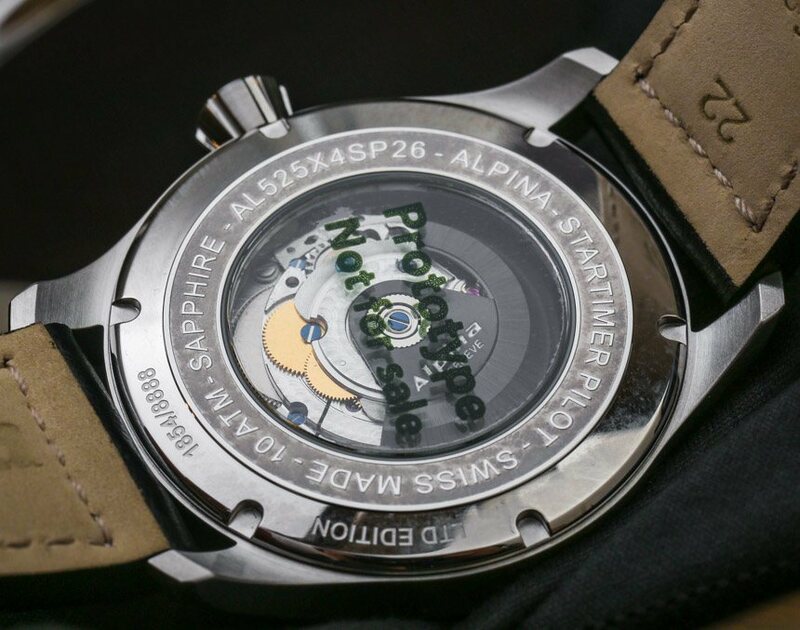 One of the more recent upgrades to the Alpina Startimer Pilot watch collection (at least some models) are the applied hour markers. Framed with a polished metal finish and filled with lume, the hour markers significantly upgrade the look over more “flat” pilot watch dials and also assist with legibility. You see this in both the three-hand and chronograph Alpina Startimer Pilot Automatic models, and it is an aesthetic feature that really helps me enjoy the collection as much as possible. These “enhanced” dials are better on the 44mm wide Alpina Startimer Pilot Automatic models that have the “Sunstar” style dials. The 40mm wide models have applied hour marker with flatter Arabic number hour markers next to them. One of the reasons that I like the larger 44mm wide models is because the dials have a peripheral chapter ring, which is darker in color, and then a ring of applied Arabic hour markers. The black colored dial version of the Alpina Startimer Pilot Automatic in either the 40 or 44mm wide size is a bit more traditional in style with a flatter dial. It serves to be the most conservative of the Alpina Startimer Pilot family, but for more personality, there are a lot of other options. 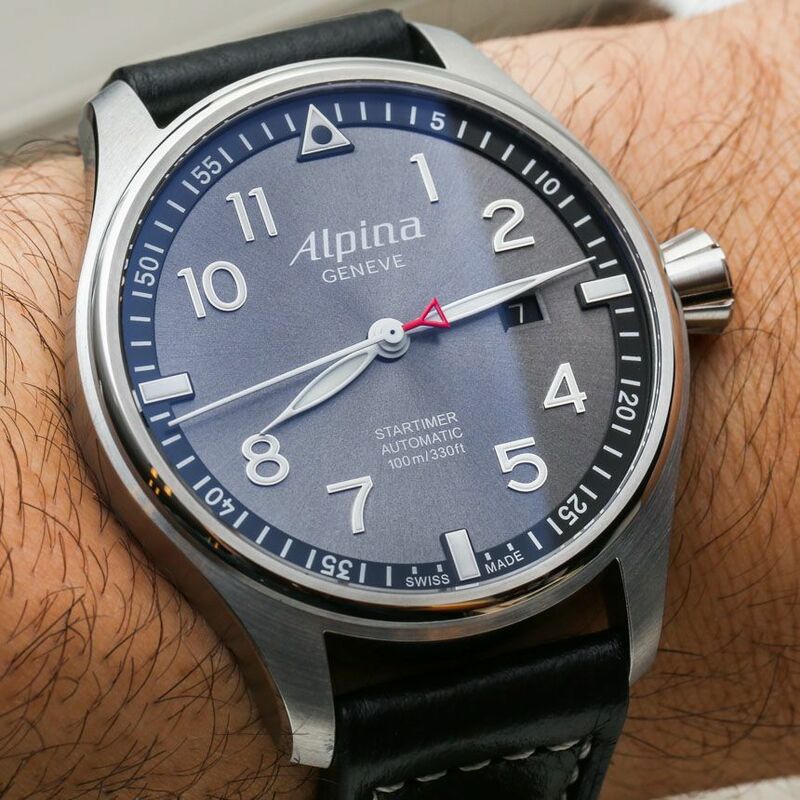 I further like that in addition to the various leather straps, Alpina makes many of their Startimer Pilot watches available on a steel metal bracelet. What is best for you really depends on your style. Bracelets are great, but many traditional pilot-style watches today come on straps. The contrast stitching of the thick leather straps Alpina provides offers some welcome personality. Personality is really important in a pilot-style watch because too many today can come across as being relatively boring. The core design of a pilot watch is something highly functional and utilitarian. Making them beautiful is a more difficult task for a range of reasons. It is like trying to build a beautiful tank. The most beautiful thing about most pilot watches is that they work well and that they signify some type of idealized masculine lifestyle. For whatever reason, dive watches – which are far more limited by their technical requirements – have somehow been able to produce a number of very attractive classics. For every beautiful classic pilot watch (some Breguet models come to mind) there are perhaps 5 or 10 extremely bland, albeit functional ones. Their legacy lives on more because of what they represented versus what they looked like. Think about it: if you were a military pilot several generations ago, you may have been given a timepiece as part of your standard issue equipment. In many instances, you didn’t even own that timepieces and it was loaned to you by the government. Today some of those models are worth some money by simple virtue that very few good condition ones survived. My intent behind having that simple discussion is to illustrate the fact that pilot watches aren’t just about suggesting flight, but are also intrinsically linked to military and commercial history – which is why so many people want one. If something in the Alpina Startimer Pilot collection isn’t your thing, there are many others out there. The metallic sunburst finished “Sunstar” or “Blackstar” deep gray dials of the Alpina Strartimer Pilot Automatics are the best Alpina has to offer, and they come in a few hues, as well as with a brushed steel or PVD black steel case. Inside the watches are Swiss Sellita automatics. I am not sure which, but likely an SW200 automatic for the three hands and perhaps an SW500 for the chronographs. 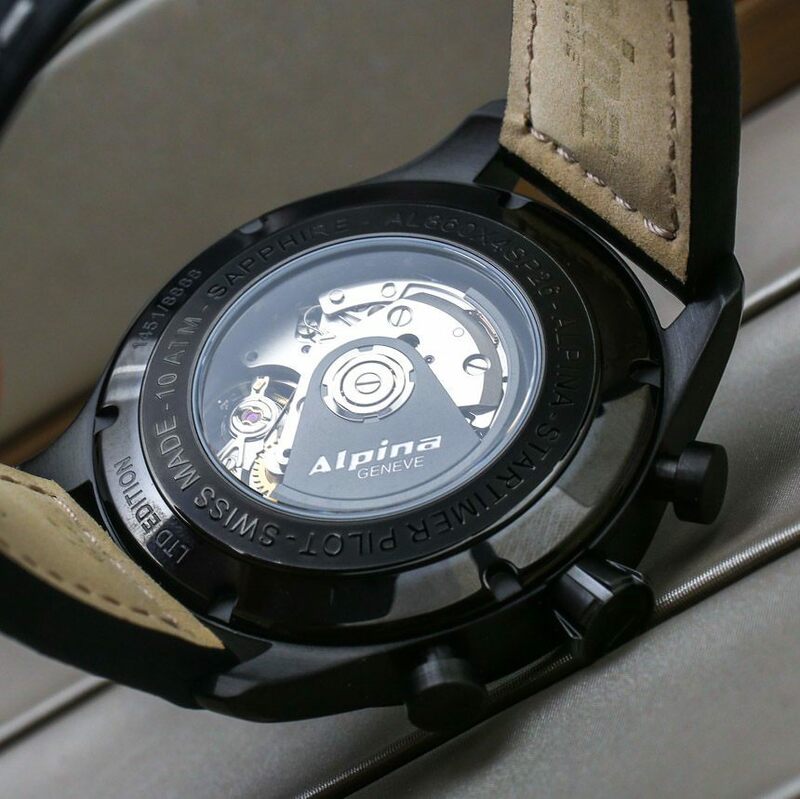 The cases are further all water resistant to 100 meters and have sapphire crystal, as well display casebacks with a view of the movement and a custom Alpina automatic rotor. 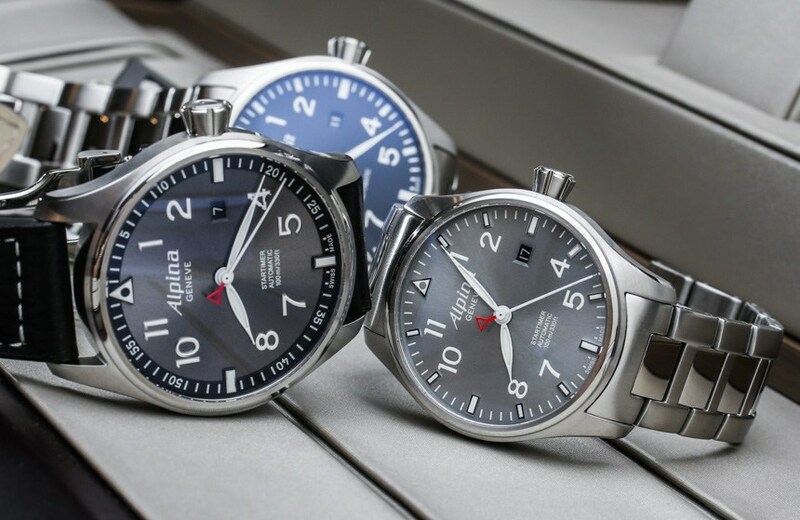 Furthermore, some versions of the Alpina Startimer Pilot Automatic collection are limited editions. Though, the models which are part of a limited edition are limited to 8,888 pieces and don’t appear to be limited over other models for any specific reason. My favorite models in the Alpina Startimer Pilot Automatic collection include the three-hand ref. AL-525GB4S6 Pilot Automatic Sunstar 44mm, the ref. AL-860GB4FBS6 Startimer Pilot Automatic Chronograph Blackstar, and the ref. Al-860GB4S6 Startimer Pilot Automatic Chronograph. Attractive, inoffensive designs but nothing to get excited about either. Nice looking watch – all of them. I find that too often pilot watches, while functional looking, are a bit bland and too many brands just phone in the design. I think these Alpinas have some visual flair, so good on them for offering them and at prices that are not crazy. I have a Paderborn flieger from Laco, type B. I don’t think it’s design is bland at all, and needless to mention its history. It’s one of my favourite watches. You could also consider the Cartier Santos a pilot watch, as it was developed by Cartier by request of Santos Dummond who is considered the first man to fly (do your research). If the price is the same for bracelet or strap, I would get the bracelet, but I think they look much better on a strap, and that is also a much more suited and classic look for a pilot watch. I think these are actually quite attractive and very well presented. I have handled them a few times, and they are also nicely finished and constructed solidly. I would have no problem adding one to my collection, I don’t find them boring or bland at all. Nicer movements would be nicer, but then of course the price gets dear. Nice looking pilots watch…especially the 44 mm version. I wouldn’t go out and buy one…I have several pilots watches…and would actually prefer a Hamilton Khaki over this one…..like the one Matthew McConaughey wore in the movie Interstellar…( which….by the way is a pretty cool movie. ) I won’t give anything away…but the watches actually are visible in the movie. I have had my eye on this one of these for a while now. I would love to get the chrono but may save some $$ and get the non-chrono Startimer. My birthday is in September so I’m thinking this would be a nice gift to myself. These are really good looking watches. Remind me a lot of the IWC Spitfire series, but at a much more reasonable price. Nothing wrong with that! I’m a big fan what they have here in this package. The non-chronograph is sharp! I’m bumping this up to the top of my potential pilot watches list. A few lume shots would have been a great addition to the review. For me, a Pilot Watch’s first requirement is to be quickly and easily legible. While in my Sopwith Camel, doing the loop-de-loop in pursuit of Baron VonRichthoven, all I want to know is what time it is so I can get back to the aerodrome in time for Happy Hour. I just scored a great deal on an almost new Alpina Startimer Pilot Automatic Chronograph. I’m counting the days until it arrives at my door! I have to say your write up inspired me search further and a great deal appeared in front of me. phb I just got myself a Alpina Startimer Pilot Automatic Chronograph. It arrived today. Beautiful watch I’m so glad I got one. However, the lume is horrible. It’s my favorite watch. Very close to pulling the trigger. Curious though whether the dial color on AL-525GB4S6 Pilot Automatic Sunstar 44mm and the ref. Al-860GB4S6 Startimer Pilot Automatic Chronograph are actually the same color. In some pictures the grey on the Sunstar looks very light, in others darker.